And that is Straight Talking Mama! aka Fiona! I absolutely cross my heart and hope to die that I pressed that button only the once, but I’m so glad it’s Fiona as I know she a. loves booze and b. works hard and deserves a reward. So, hurrah! Email me your postal address please, me dear. And so this isn’t simply an announcement post, here’s a photo of the Vintage Mafia in our matching Heyday Fleur dresses (which are still on sale I see! 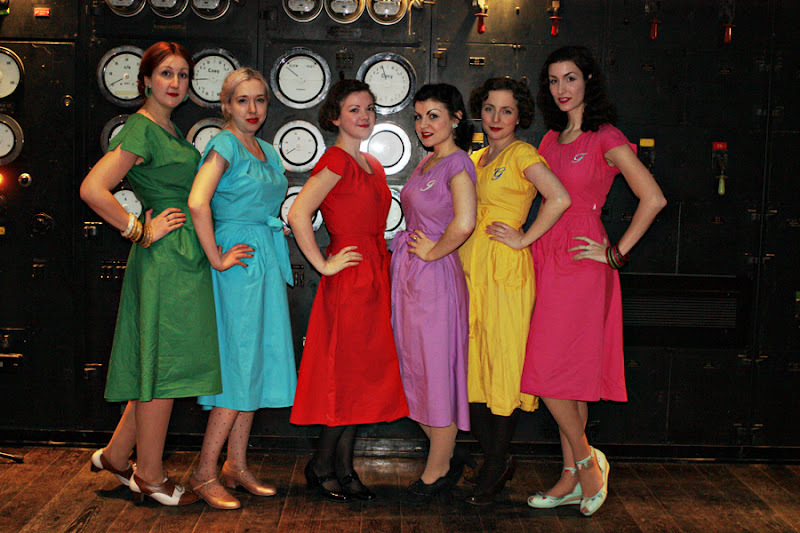 ), taken on Friday night after we had finished styling in our little vintage boudoir at the Churchill War Rooms after hours event! Come to the next one, won’t you (or hire us for your event)? Back tomorrow with something a little different – a film review post. It’s good to change things up a little, don’t you think? Have a glorious rest-of-Sunday, all! oh wow it's ME!!! Thanks Fleur! Love those VM matching dresses, too.